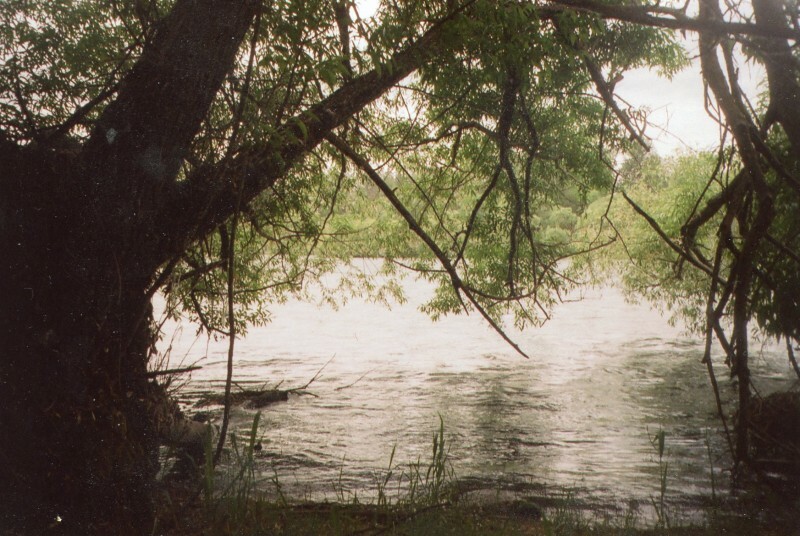 This image shows the banks of the Spokane River, near the place where James Birnie’s Spokane House stood. This was originally an American Fur Company post, but both the North West Company and the HBC operated out of this post. David Thompson’s older Spokane House stood a few miles upriver. Alexander Caulfield Anderson’s father in law was James Birnie. He is my great-great-grandfather, and this is his story. I will post this in many parts, because I know a lot about James, and about Charlot[te] too. I keep finding more: James Birnie often appears when I least expect him to turn up. 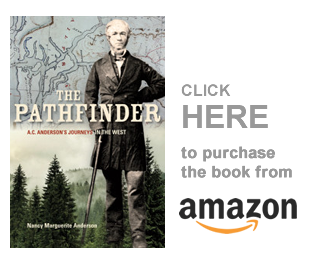 This post will contain a little new information about the man who was the founder of the town of Cathlamet, Washington State. If you want the sources for all the statements I make in this post — both about James, and his wife Charlotte — please go to my old blog, Fur Trade Family History at furtradefamilyhistory.blogspot.com — and read the article “James Birnie, Laird of Cathlamet,” dated Sunday, September 2, 2012. The introduction: The Hudson’s Bay Company took over the Columbia district from the North West Company in 1821, and for the next two decades the British traders and their Chinookian (Native) neighbours remained relatively undisturbed by the Americans, who by agreement between the British and American governments, jointly owned the territory the British fur traders occupied. The HBC men knew their business would eventually be threatened by American settlers, but it was not until the men of the United States Exploring Expedition returned home from Puget’s Sound, that the settlers came in larger numbers. By the mid-1840’s Americans had settled the territory in sufficient numbers to negatively affect the fur traders’ business, but one trader saw opportunity. James Birnie, a Scottish born company clerk with 28 years of anticipation and disappointment in the service of the Hudson’s Bay Company’s furtrade, retired to build a home at a place he called “Birnie’s Retreat.” The Retreat became Cathlamet, and the settlement’s founder thrived and became relatively rich. The self-satisfied James Birnie considered himself to be the Laird of Wehkaikhum and Charlot his lady, but they were unlikely royalty. Neither James nor Charlot had begun their lives at the top of the social heap — anything but, in fact. Born in Scotland in late 1796, James Birnie was baptized in St. Nicholas’ Parish, City of Aberdeen, on December 18. The baptismal certificate recorded that James’ father was a tanner named Robert, and Robert’s birth record stated he was born in the City of Aberdeen in 1765. Robert’s father, James, was a shoemaker when he married Isabel Moir in Old Machar, Aberdeen City, on February 9, 1763. Cathlamet’s founding father was descended from three or more generations of labourers who worked with leather and hides in the old part of Aberdeen City. The younger James Birnie, however, chose no such career as shoemaker or tanner, but joined the fur trade of the North West Company [NWC]. It is possible that, at that time, the NWC was hiring men familiar with tanning and leather, and that Birnie’s future job in the company might have been to stretch and prepare the beaver pelts that trappers brought into the camp. From: Dictionary of Scottish Emigrants to Canada Before Confederation, volume 2, by Donald Whyte, Ontario Genealogical Society, 2008: “541. Birnie, James, 1799-1864. From Aberdeen. To Montreal, Que, 1818, to become a clerk with the NWCo. Served at Ft. George, and at the coalition of 1821, transferred to HBCo. Served at various points in the Columbia dist. Birnie Island, Port Simpson, named after him. Retired 1846, and settled at Cathlamet, where he was in charge of an agency of the HBCo. Daughter, Mrs. Grahame. MRL 428. HBM202. James Birnie set out from Scotland in early 1818 — though family stories say he spent two years learning the language of the fur trade from a priest in Lachine or Red River, he did not. He must have arrived at Lachine [west of Montreal] in summer 1818, and been rushed into the canoes that would carry him west to Spokane House. His route would have taken him west, via the Ottawa River, Mattawa and French to Lake Huron. He would have traveled west again to Sault Ste Marie, into Lake Superior. I believe at that time (1818) the NWC headquarters would have been at the very end of Lake Superior — but I will check the date it moved. From the interior headquarters on Lake Superior, Birnie traveled north and west through a system of lakes that included Lake of the Woods and the Winnipeg River to Lake Winnipeg. Now, this is NWC history, and in 1818 the HBC, at York Factory, and the NWC at Lachine, were involved in a bitter war. As Birnie’s brigade reached the north end of Lake Winnipeg, the NWC men were at risk of meeting the HBC men in their York boats. The NWC men would have traveled north up Lake Winnipeg very carefully, avoiding conflict with any HBC men they might have spotted. (They may have even had an alternate route through Lake Winnipegosis or elsewhere). Once they entered the Saskatchewan River they would have had to keep an eye open. This may have been quite a stressful journey; however, they also traveled in quite large brigades. The brigade probably left the Saskatchewan River at Cumberland Lake, where the HBC post of Cumberland House stood. They would have been very careful as they paddled past Cumberland House and entered the river at the lake’s north end. This was the Sturgeon-Weir or Maligne River, and it led them north to Amisk Lake, the upper Churchill River via Frog Portage, Lac Ile a la Cross, Peter Pond Lake, the Methye River and the Methye Portage — often called the Portage la Loche — into the beautiful Clearwater River. They then followed the Clearwater west to the Athabasca, and journeyed west again, all the way to their various posts just east of Athabasca Pass [Jasper, AB]. James Birnie entered the Columbia district via the Athabasca Pass and Boat Encampment in early November 1818. He may have traveled down the Columbia River all the way to the company’s headquarters at Fort George [Astoria], but it is more likely he left the canoes at Donald McKenzie’s newly constructed Fort Nez Perces, on the Walla Walla River. The primary purpose of McKenzie’s Fort Nez Perces was to serve as headquarters for his trapping expeditions into the Snake River Basin. On the banks of the Boise River McKenzie’s trappers found beaver, and a month later they hunted the fur-rich territory between the Snake and Green River. James Birnie arrived at Fort Nez Perces too late to join the first party of trappers, but by the time clerk William Kittson reached McKenzie’s Boise River camp in May 1819, he found James Birnie already there. In spring 1820, Birnie left Spokan House, accompanying the men who delivered the beaver pelts to the company’s headquarters at Fort George. With Birnie travelled the then fourteen-year-old daughter of an ex-North West Company employee named Joseph Beaulieu. At Fort George, the gentleman in charge (likely James Keith) married Birnie to Charlot Beaulieu. In 1821, the North West Company that James Birnie worked for, and the Hudson’s Bay Company merged under the name of the Hudson’s Bay Company. The Governor of the new HBC, George Simpson, made severe cuts in the numbers of men employed in the forts west of the mountains, and Chief Factor John Haldane of Spokan House gave his opinion that, of the men who worked in his district, five clerks and two apprentice-clerks might be re-engaged, and the rest released from the Company’s service. James Birnie was one of the men who Haldane chose to re-hire at 75 pounds a year. In April 1822, clerk Finan McDonald recorded in the Spokane House journals that Birnie had left for Fort George with seventy-five packs of furs. On July 16, Birnie returned to Spokan House, and on July 23 he took over the post journals. Now twenty-six years old or thereabouts, James Birnie expected that the HBC’s fur trade would provide him with a rewarding career, with promotion to chief trader in time. On August 15, 1822, Charlot Birnie gave birth to their first child, Betsy. The child grew up to marry Alexander Caulfield Anderson, and so is my great-grandmother. In the Birnie family Bible, James’s eldest daughter is named Betsy. I believe that Anderson probably gave Betsy the more sophisticated name, Eliza, when they were married. “October 1823, Friday 24. Fine pleasant weather. Mr. Birnie a gentleman from Spokan arrived with men and horses to take up the articles destined for that post. Yes, you are. I have seen your name on Ruth Crook’s Facebook page. Welcome, and do you want access to the Birnie Family Tree on Ancestry.ca? I AM RESEARCHING THE FAMILY HISTORY OF JOHN BIRNIE EWEN FOR A HIS GREAT NEPHEW AND WONDERED IF IT WOULD BE POSSIBLE TO SEE IF HE APPEARED ON YOUR FAMILY TREE. No, we have no John Birnie Ewen in my tree as far as I know. Sorry.